GURPS has never run with such mechanical precision before! 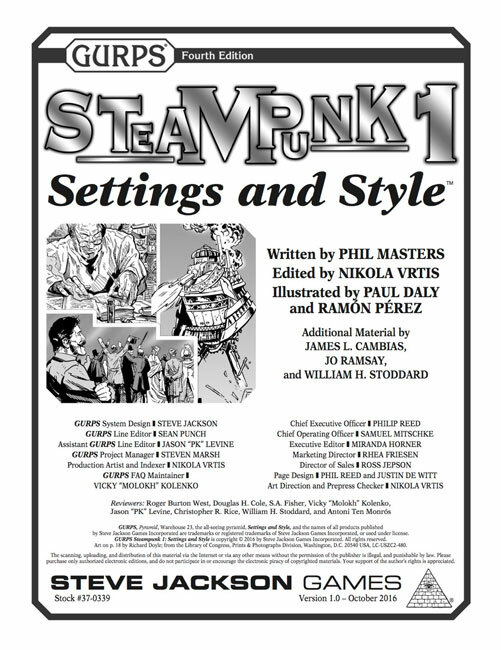 GURPS Steampunk 1: Settings and Style explores the inner workings of steampunk games. Get advice for running various models of steampunk campaigns, from a Kipling-inspired "scientific romance" to steampunk anime-style. Find out how to add steampunk technology to your game, with support for styles such as clockpunk, raygun Gothic, and mad biology. Learn about the social and cultural aspects of steampunk, too. Etiquette and status systems, for example, will help players experience the steampunk sensibility. 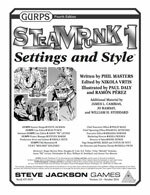 GURPS Steampunk 1: Settings and Style is a perfect companion to the award-winning GURPS Steampunk supplement for GURPS Third Edition. Get to your steampunk destinations with panache with GURPS Vehicles: Steampunk Conveyances, an assortment of more than 30 different vehicles of varying realism. Social standing is everything in the Victorian era, so help bring your personal interactions to life with GURPS Social Engineering.